Is there a superstar effect? 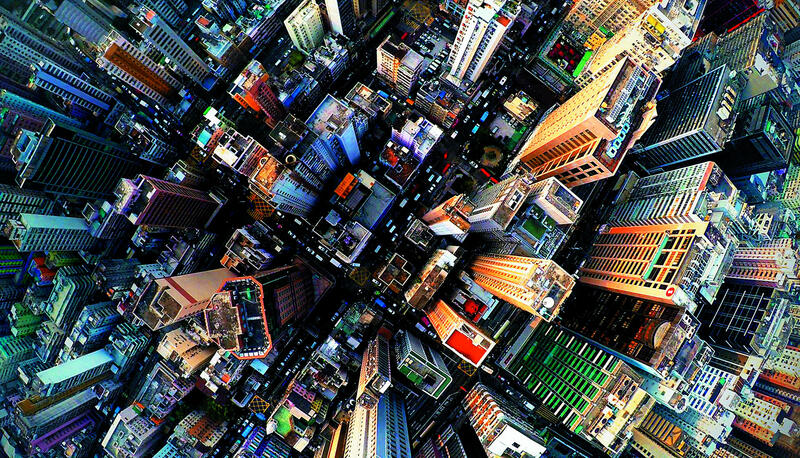 McKinsey Global Institute research uncovers the dynamics of superstar firms, sectors, and cities in the global economy. There is much discussion about “superstar” firms and “superstar effects” in reaction to the rapid growth of very large global companies. This has been accompanied by a growing body of research examining various aspects and drivers of superstar effects in the economy. Yet questions remain, and much of the evidence is still inconclusive as well as incomplete. Our research aims to fill some of the empirical and data gaps, take a global perspective, and examine the issue beyond just firms. We assess the extent to which a superstar effect can be observed in the global economy in three arenas—firms, sectors, and cities—and inspect the dynamics, including churn and changing characteristics, in each of these arenas. We also examine what characteristics, similarities, differences, and linkages can be observed across firms, sectors, and cities and what economic effects and questions they raise for further research. At the same time, we draw some preliminary implications for leaders. We find superstars exist not only among firms but among sectors and cities as well, although the trend is most evident among cities and firms. Relative to peers, superstars share several common characteristics. In addition to capturing a greater share of income and pulling away from peers, superstars exhibit relatively higher levels of digitization; greater labor skill and innovation intensity; more connections to global flows of trade, finance, and services; and more intangible assets than do their peers. Yet there are some variations. We find a higher churn rate among superstar firms compared to cities, indicating higher levels of persistence among superstar cities. Although a variety of definitions exist, we define superstar to mean a firm, sector, or city that has a substantially greater share of income than peers and is pulling away from those peers over time. For firms, our metric is economic profit, a measure of a firm’s invested capital multiplied by its return above the cost of capital. We focus on economic profit rather than revenue size, market share, or productivity growth because these other metrics have a risk of including firms that are simply large and might not create economic value. For sectors, our metric includes gross value added and gross operating surplus accruing to various types of activities (such as production, sales, and services) that cut across business establishments such as factories, laboratories, and retail stores. 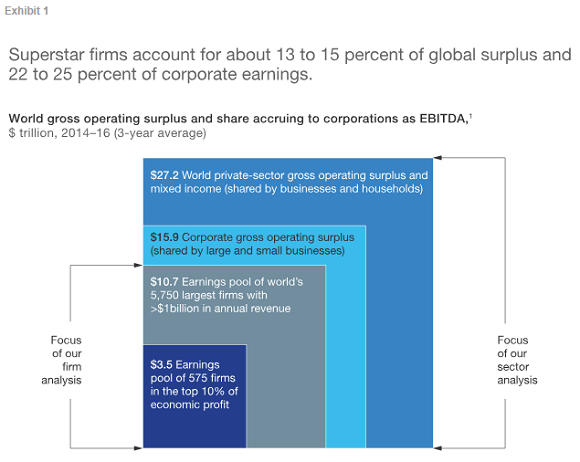 In part, a sector perspective provides an indication of the size of superstar profits in relation to the entire economy—at $3.5 trillion in pretax earnings, superstar firms’ earnings represent 13 to 15 percent of the entire global pool of economic surplus and 22 to 25 percent of all corporate earnings worldwide (Exhibit 1). For cities, our metric includes GDP and personal income per capita. These measures allow us to discover which economic activities are becoming more valuable over time, where the benefits flow, and what linkages exist, if any, among sector activities and superstar firms and cities. Download ‘Superstars’: The dynamics of firms, sectors, and cities leading the global economy (PDF–953 KB). James Manyika is chairman and director of the McKinsey Global Institute, where Jacques Bughin and Jonathan Woetzel are directors, and Sree Ramaswamy is a partner. Michael Birshan is a senior partner in McKinsey’s London office; Zubin Nagpal is a consultant in the New York office.